Eaton's RX Series soundproofed IT racks are an intelligent, quick, safe and secure way to house IT equipment within a noise sensitive environment. 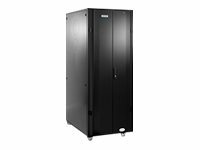 The RX Series effectively provides a rapidly deployed well-equipped server room within a single rack footprint. Built-in environmental monitoring (IMS) system, accessible via the integral graphical user interface. Eaton's RX Series soundproofed IT rack is an intelligent, quick, safe and secure way to house IT equipment within a noise sensitive environment. Cooling is effectively and efficiently controlled and managed by the use of temperature sensors and variable speed fan controls which manage the 2 EC fans fitted within the rear doors.